Located close to some of the most famous tourist destinations in Italy such as Amalfi, Pompeii, Positano and Paestum, Salerno is one of the best destinations in which to study Italian. Salerno is a traditional city in the south of Italy, it is safe, uncrowded and cheaper than other places, which makes it an ideal location to spend your holiday and improve your Italian skills at the same time! In Salerno you can enjoy the charming medieval old town as well as the wonderful seafront promenade and the beauty of the coast. We invite you to discover this enchanting place, its traditions, food, typical products and the warmth of the local people whilst taking an Italian language course. Our school is located in the centre of the city, in a well preserved historic building on the seafront promenade, giving a beautiful view over Salerno bay. The school has 14 classrooms, a multimedia room with 8 computers, 1 cinema room, a library and a café. 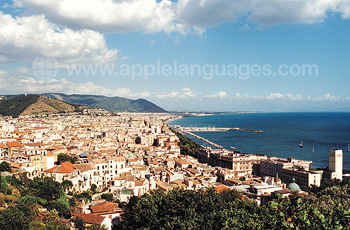 Learn Italian in Salerno for two weeks with students of a similar age. The course is made up of 20 lessons per week (45 minutes each) from Monday to Friday, with 4 lessons per day, with a maximum of 10 students in the classroom. We offer accommodation in a local host family or in a studio apartment. All accommodation is within walking distance of the school. 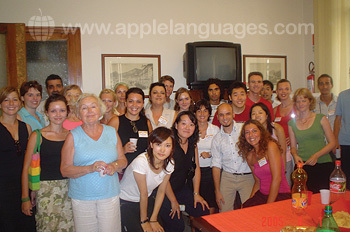 Italian hosts are very friendly and welcoming, they make each student feel like part of their family. You can choose homestay accommodation on a bed & breakfast or half board basis. This is the best way to practise the language, get to know more about the Italian culture and improve your communication skills! Studio apartments are offered on a self-catering basis and are ideal if you are looking for a more independent solution. Enjoy the wide range of social and cultural activities that our school in Salerno is happy to offer for the 50+ programme. This is the best way to discover more about Italian customs and history, to try the food and wine of the Campania region and see wonderful and picturesque landscapes! You can visit the mozzarella, olive oil, wine or limoncello factories followed by tastings, join a practical cooking class and a pottery class, or participate in seminars on Italian culture. 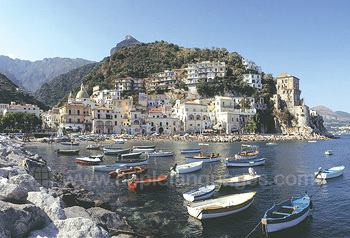 Excursions can be arranged to locations such as Amalfi, Pompeii, Paestum, Positano, Ravello or Naples. This program is suitable for mature students aged 50 or over, who want to experience the Italian language and its culture with people of a similar age. The closest airport to Salerno is Naples International Airport, which is located about 50 Km away from Salerno. Our school can arrange a transfer from the airport or the train station in Naples to your accommodation at an additional cost. It is also possible to get Salerno on a direct train from Naples.